Lucy Ash meets the Romanian sheep farmers who stormed parliament over plans to limit numbers of sheepdogs and restrict grazing rights. Why are hunters now their arch enemies? 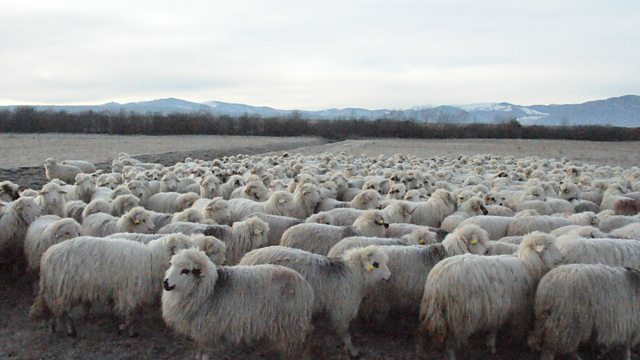 Lucy Ash asks why thousands of angry Romanian shepherds recently stormed the parliament in Bucharest. Sparked by an amendment to Romania's hunting law, the unprecedented protest was over plans to limit numbers of sheepdogs and restrict grazing rights. The increasing size of flocks is leading to growing conflict with both hunters and conservationists over land use. Romania has an influential hunting lobby - around two thirds of MPs are hunters - and they accuse shepherds dogs of scaring off or sometimes even killing their quarry. They also claim overgrazing is damaging the natural habitat of the deer, the boar and other wild animals they hunt. Environmental campaigners are concerned that winter grazing by ever larger flocks is having a catastrophic effect on biodiversity. At heart this is an argument about what the countryside is for. Is its main purpose an economic one? Is it primarily for leisure? Or should it be about the people who live there? Shepherds insist the law is an attack on centuries of sheep-rearing and their culture and traditions.